Have you ever enjoyed a slam or two and thought, “I could do this,” but felt apprehensive staring at that empty mic—or worse, you climbed up on stage and struggled? Let Marc Kelly Smith, the founder of Slam Poetry, teach you everything you need to be a confident performer, from writing a powerful poem, to stage techniques, to going on tour (if that’s where your muse leads you). Take the Mic is filled with insider tips, backstage advice, and tons of examples of slam poems that wake up an audience. With this book, you’ll also be able to link to the PoetrySpeaks.com community to listen to samples, meet poets, and unearth inspirations for your next performance. 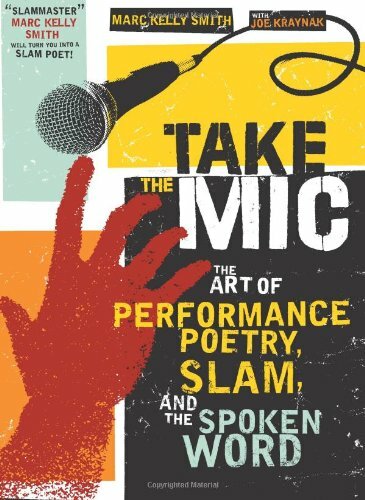 Take the Mic is packed with practical exercises you can do alone or in class to hone your skills and transform your body, mind, voice, verse, and spirit into an engaging stage presence. You’ll also find a brief history of slam, the rules and regulations that govern official slam competitions, and a list of PSI (Poetry Slam, Inc.) Certified Slams, so no matter where you are, you always have a place to Take the Mic!